This tutorial will step you through the details of deploying a Web Application to the Oracle Application Server Containers for J2EE (OC4J). By Raghu Srinivasan, Oracle Corporation. The Eclipse Web Tools Platform project release 1.0 M8 has added support for deploying Web Applications to the Oracle Application Server Containers for J2EE (OC4J). This tutorial will step you through the details of installing and configuring the Oracle Application Server Container for J2EE (OC4J) and deploying a Web Applications from the Eclipse Web Tools Platform to the Oracle Application Server. You must first install the Jaav2 Platform, Standard Edition (J2SE) version 1.4.2. You can get the latest release of J2SE 1.4.2 from the Sun's web site.. Install the JDK. Make a note of the folder in which you install J2SE. This will be required later in the tutorial. You need to download and install the WTP 1.0 release build. Download the WTP all-in-one package. It includes the complete set of software to start using wtp immediately. And finally, you need to download, install and configure the Oracle Application Server Containers for J2EE (OC4J). The server adapter in the WTP 1.0 release is certified for the OC4J 10g (10.1.3.0.0) release. The Oracle Application Server Containers for J2EE (OC4J) zip distribution provides a complete J2EE 1.4 server environment, distributed as a simple zip file. You can download the server from the Oracle download site. Extract the oc4j_extended_101300.zip file using any archive utility which handles zip files, including the jar utility in the J2SE. ORACLE_HOME: Directory where oc4j_extended_101300.zip was extracted. You should see the following messages in the console. You will be prompted to enter the password for the OC4J administrator account. Make a note of the password. Confirm password: The password for OC4J administrator "oc4jadmin" has been set. 05/10/20 14:10:41 The OC4J administrator "oc4jadmin" account is activated. This completes the installation and configuration of all the required software. User name of the OC4J administrator account is oc4jadmin. The password for the administrator account. Open the J2EE perspective; select Window > Open Perspective > Other menu and in the resulting dialog, choose J2EE. The J2EE perspective includes the Servers view, which is the focus for the rest of the tutorial. You will also need the Console view to see the output of the Server. Select Window > Show View > Console menu. $EclipseInstallFolder\eclipse\eclipse.exe -vm "$J2SEInstallFolder\bin\javaw.exe" -clean -data "$WorkspaceFolder"
where $EclipseInstallFolder is folder where you installed Eclipse and $WorkspaceFolder is where you want to create new or access an existing Eclipse workspace. Figure 1 shows the Eclipse Workbench displaying the J2EE perspective. Note the Servers view and the Console view. Figure 1. The Eclipse Workbench with the Servers view and the Console view. Register the JDK you installed with Eclipse. Select the Add button and in the resulting dialog, add the JDK you installed above. For the field JRE home directory , point it to the root folder of the J2SE install and not the jre sub-folder. Next you register the Oracle Application Server runtime and create a server. Right-click in the Servers View and select New > Server menu. This launches the New Server wizard. Figure 2 shows the New Server Wizard with the Generic Oracle OC4J Standalone 10.1.3 DP4 Runtime selected. In the Define a New Server panel, Select Oracle > Generic Oracle OC4J Standalone Server 10.1.3 DP4. Click Next. For JRE, select the JDK you registered above. For Oracle J2EE Home, browse to the subdirectory j2ee\home in the folder where you installed the Oracle Application Server. Click Next. 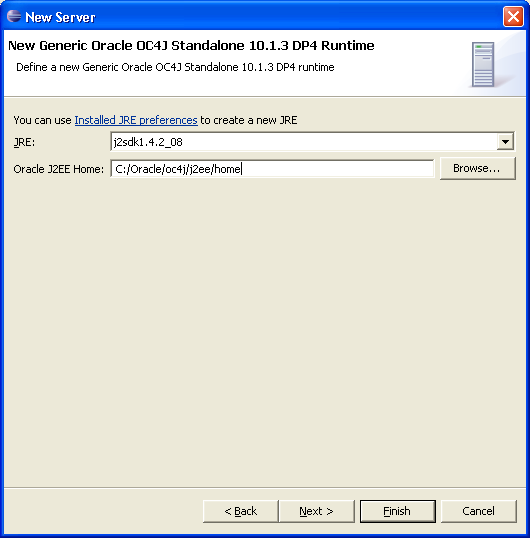 Figure 3 shows the panel to register the Generic Oracle OC4J Standalone 10.1.3 DP4 Runtime. Set the password to the password for the administrator account you created during the Oracle Application Server install. Accept the defaults for all the other fields. Click Finish. You will see the Oracle OC4J Standalone 10.1.3 DP4 Preview server in the Servers view. Right-click on the server and select Start to start the server. This starts the server and displays the output in the Console view. Figure 4 shows the Oracle OC4J Standalone 10.1.3 DP4 Preview server in the Servers view. You will now build a simple JSP application that you will then run on the server. The Eclipse WTP web site has a several tutorials that can help you build sophisticated applications using the WTP tools. The first step to build a JSP application is to create a Dynamic Web Project. From the ProjectExplorer view, right-click on the Dynamic Web Projects folder and select New Dynamic Web Project menu. Enter a name for the project, say, DemoOC4J. Click on the button, ShowAdvanced. Note that the Target runtime field is pre-populated with the entry for OC4J: Generic Oracle OC4J Standalone 10.1.3 DP4. Accept the default values for all the fields in this dialog. Click Finish. This will create the project. Next, you will create a JSP page. Open the Dynamic Web projects folder. Expand the project you created to the WebContent folder. Right-click on the WebContent folder and select New JSP menu. Enter a name for the file, say, index.jsp. Click Finish. You are ready to run the page on the server. Right-click on the jsp file, index.jsp, in the ProjectExplorer. Select Run As > Run on Server menu. 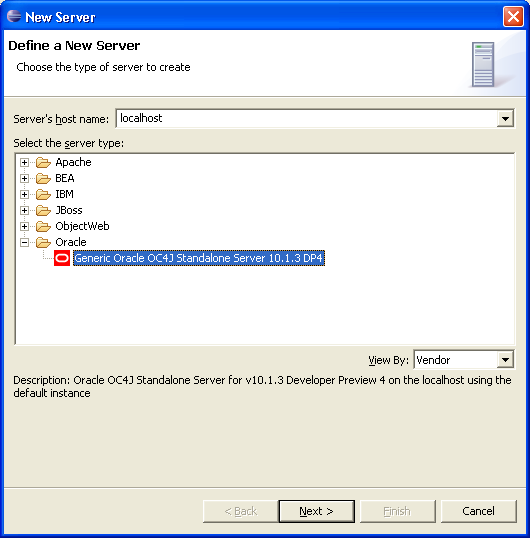 In the Run On Server dialog, ensure that the server, Oracle OC4J Standalone Server v10.1.3 DP4 Preview, is selected. Click on Finish. The Console view displays the log tracking the progress of the deployment. Figure 5 shows the application running on Oracle OC4J Standalone 10.1.3 DP4 Preview server. Figure 5. Running the application on Oracle OC4J Standalone 10.1.3 DP4 Preview server. 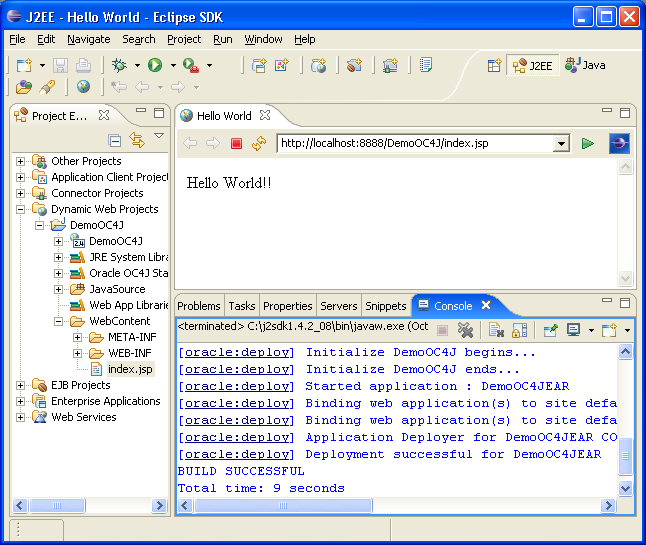 In this tutorial you have learned to configure the Eclipse Web Tools Platform Project to deploy and run a web application on the Oracle Application Server. The WTP web site has articles and tutorials that explain the numerous tools provided in WTP to help you build and deploy web applications. The Oracle web site has extensive resources to help you explore the capabilities of the Oracle Application Server.